The Individual Achievement Grant celebrates individuals who have achieved outstanding results in their chosen field. Funds are available to residents of the Moreton Bay region who have qualified or been selected by a peak body to represent Queensland or Australia. Applicants are strongly encouraged to read the Moreton Bay Regional Council’s Individual Achievement Grant guidelines to determine their eligibility and for further information about each funding opportunity. Applications are invited all year round and can be submitted at any time. Two youth choristers from the Moreton Bay Region recently performed at the Anzac Day Commemorative Services on the Western Front in April 2016, with some financial assistance from the Individual Achievement Grant, an initiative under council’s Community Grants Program. 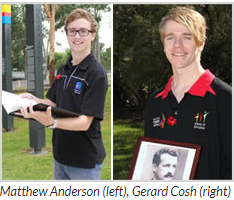 Matthew Anderson and Gerard Cosh (both pictured) are part of the Voices of Birralee Choir, which was selected by the Australian Government to perform at Villers-Bretonneux in France on Anzac Day. Gerard said the opportunity to perform in France on Anzac Day meant a lot to him, and Matthew was looking forward to reflecting upon his own family’s history during the trip. Both choristers received $350.00 each under the Youth Achievement category of the Individual Achievement Grant; a council initiative which aims to encourage and celebrate individuals who have achieved outstanding results in their chosen field. A local Moreton Bay athlete has been selected from a plethora of keen youth from across Australia, as one of twenty in the Australian Girls 16’s Team, to represent our country at the Trans Tasman Oz Tag test series. The event, held in Auckland, New Zealand, was a play-off between the Tagaroos and Kiwi Tag Blacks. The youth division of the Trans Tasman test series takes place every second year. Rachael, alongside her 19 teammates, came head-to-head with stiff competition from the strong New Zealand side. Rachael was supported under the Youth Achievement category of the Individual Achievement Grant. She was awarded $350.00 to offset travel and event related expenses. This category provides support to young people aged 25 years or younger who have qualified or been selected by a peak body to represent Queensland or Australia in their area of interest.